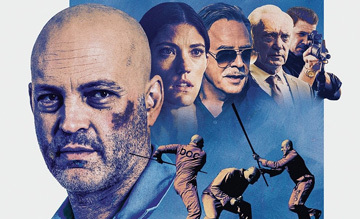 Vince Vaughn goes from half-assed to hardass in this rock solid beat-em-up from the director of Bone Tomahawk. Hard-edged exploitation flick from the writer-director of Bone Tomahawk. After several years of lackadaisical work in awful comedies, Vince Vaughn decided to return to dramatic-thrillers and here he steps up three gears to give the best performance of his career. He’s totally convincing as a shaven-headed, southern-drawled hardass. His arm-breaking, head-stamping brawls are extremely entertaining, often shot in one wide take to highlight the choreography. As with Bone Tomahawk, there’s fantastic cowboy-y dialogue, one-liners and speeches. It’s also most amusing when it chooses to be, as in the check-in sequence. Director S. Craig Zahler realised that the grotesque scalping scene at the end of Bone Tomahawk became great talking-point marketing and so finds equally shocking, and effective, moment(s) for the final act here. Vaughn’s frustrated Street Fighter take down of a car earlier is pretty memorable too. On the downside for some, it has a deliberately sauntering pace, and no sooner has one location been established than he’s off to the next one. The jail sets are small-scale and somewhat unconvincing. And when Vaughn derobes he doesn’t exactly have the body of a fighting machine. Still, Zahler is becoming a bonafide auteur, and echoes Tarantino’s ability to tap the unseen potential of an actor who seemed spent. 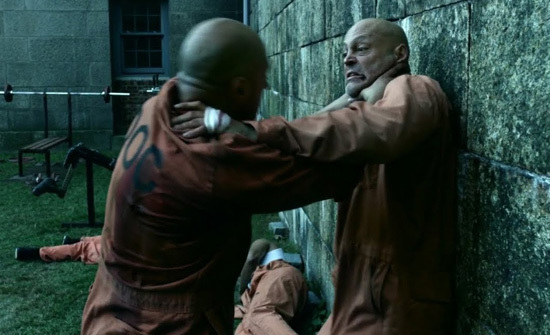 Brawl In Cell Block 99 is out in UK and US cinemas now, and available on iTunes in the UK.